1. Preheat oven to 325 degrees. Spray two 10-inch round cake pans with cooking spray; set aside. 2. In the bowl of an electric mixer fitted with the paddle attachment, cream together butter and sugar until light and fluffy, 5 to 6 minutes. 3. Add eggs, one at a time, and beat until creamy, occasionally scraping down sides of the bowl using a spatula. 4. In a large bowl, sift together flour, baking powder, and salt. In a small bowl, mix together cream, vanilla, and coconut extract. 5. With mixer on low speed, add flour mixture, alternating with cream mixture, beginning and ending with flour; beat until just combined. 6. Pour batter into prepared cake pans and bake until a toothpick inserted into the cake comes out clean, 40 to 45 minutes. 7. Let cool completely on a wire rack before removing cakes from pans. 1. Place cream, sugar, and butter in a medium saucepan and bring to a boil over medium-high heat, stirring occasionally until sugar is dissolved. 2. Meanwhile, in a small bowl, mix together cornstarch, vanilla, and 1 tablespoon water. Add to cream mixture, bring to a boil, and simmer until thickened, about 1 minute. 3. Place coconut in the bowl of a food processor. Pulse until coconut is finely chopped. 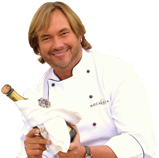 Remove cream mixture from heat and stir in coconut until well combined. Transfer to a large baking dish; let cool. 9 cups Shredded coconut for finishing cake. 1. Place butter and cream cheese in the bowl of an electric mixer fitted with the paddle attachment; beat until creamy. 2. With mixer on low speed, slowly add vanilla extract, seeds from vanilla bean, and confectioners’ sugar. Continue beating until smooth and creamy, about 3 minutes. 3. Spread filling over layer 1 of the cake. 4. Place the second layer on top and then first entire cake beginning at the sides and working your way up. 5. 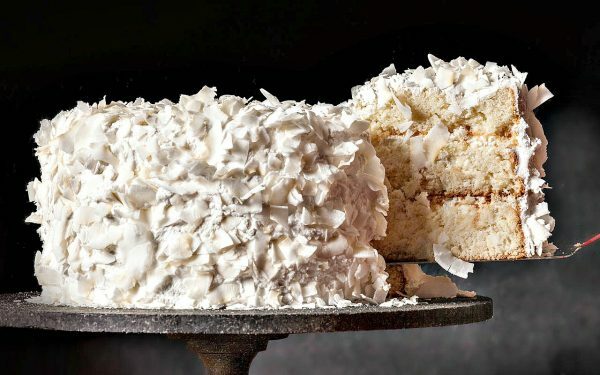 Once iced, gently pat on plain coconut on sides of cake pressing gently until it sticks. Finish on top. 6. Store in fridge, but serve at room temperature. -Post it to Instagram as “Mezzaluna’s Coconut Cake” and tag @chefjohnpaulk.